International oil giant Exxon Mobil is taking some lumps today, but that has opened up a buying opportunity for investors. This article was updated on August 9, 2017, and originally published on March 2, 2017. ExxonMobil Corporation (NYSE:XOM) is one of the world's largest integrated energy companies. If you're thinking about investing in the oil and natural gas industry, you should put this diversified global player on your short list. Here are seven reasons now could be a good time to buy this stock with the plan to hold it forever. One of the biggest knocks against oil is that the world is moving away from dirty, carbon-based fuels. That may be true over the very long term, but it's going to be a transition, not an instant cut. For example, in OPEC's world oil outlook, the influential oil organization highlights continued population growth as a key driver of slowly expanding energy demand. OPEC expects renewable energy demand to grow faster than any other energy option through 2040, with a 6.6% annual growth rate. (Note that this is off a relatively small base.) Oil demand, meanwhile, is still expected to grow 0.6% annually. That may not sound like much, but it's enough to increase total demand by 17% between 2014 and 2040. Yes, renewables will be making the headlines, but oil isn't going away anytime soon. And there's enough room for oil demand to grow, even if its slice of the total pie declines. This is big-picture, but the first reason to look at ExxonMobil is that the hype about oil going away is overblown. The second reason to like Exxon is its global reach and product breadth. This goes beyond the concept that Exxon has operations around the world and, thus, isn't reliant on just one region to support its business. After all, oil is a globally traded commodity that's easy to transport -- which is one of the reasons the fuel is so popular. Being in the right places in the world is good, but not enough. The real benefit of diversification at Exxon goes a little deeper. For example, it has operations in offshore drilling, onshore drilling, and Canadian oil sands; it drills for oil and gas; and it uses its oil and gas to make chemicals and other refined products, like gasoline. Drilling for oil is a huge part of the business, but it isn't the only part. And even when it comes to drilling, Exxon is doing more than just one thing. Take a look at 2015 for a quick example of the benefits of this diversification. It was a horrible year for the company's drilling operations, which saw earnings fall roughly 75% as oil prices fell. The company's downstream operations, though, saw earnings more than double, benefiting from the lower oil prices improving the company's refining margins. That wasn't enough to make up for the declines in the upstream business, but it certainly helped soften the blow of a deep oil downturn. Exxon's broad diversification, then, can help you stick around even in the worst of times. Points one and two are available from other oil majors, including Chevron (NYSE:CVX). However, when it comes to increasing dividends year in and year out, Exxon stands apart from the pack. It has shown a commitment to rewarding shareholders that no other oil major can match. To put a number on that, Exxon has increased its dividend year-in and year-out for 34 years. I highlighted Chevron here because it's the only oil major that comes close to Exxon, with a 29-year streak. While both are impressive, Exxon has a longer run. But there's more to this story. Chevron actually kept its dividend static for 10 consecutive quarters during the oil downturn that started in 2014. That's two and half years without a hike. The annual streak stayed alive because Chevron has a history of increasing the dividend during the middle of the year -- it was a timing thing. Exxon, meanwhile, increased its own dividend each year during the downturn. It shows a vastly different level of commitment to shareholders. That's not the only reason to like the dividend, which brings us to item No. 4 on our list. 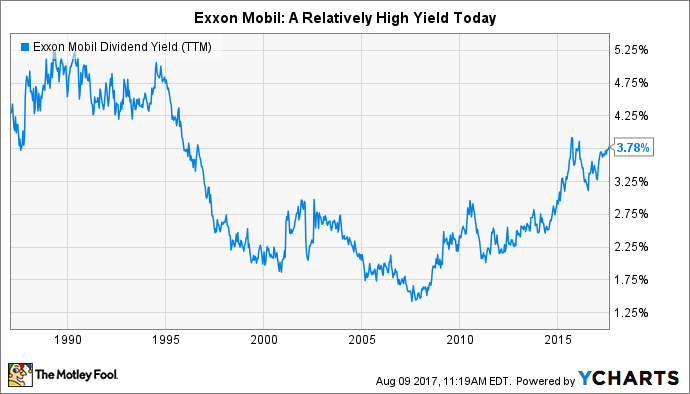 Right now, Exxon's yield is toward the high end of its historical range. This is a rough gauge of valuation suggesting that Exxon is trading cheaply relative to its own history. Put another way, now could be a good time to buy the stock. However, a cheap price isn't a good deal if a company is on the edge financially. Luckily, Exxon is nowhere near the financial precipice. In fact, it's one of the best-financed oil majors around. True, like its peers, Exxon used debt to fund its dividend and capital spending during the downturn, when cash flow was tight. That's clearly not desirable. However, even after one of the deepest oil reversals in recent history, Exxon's long-term debt (at roughly $25 billion on June 30, 2017) makes up less than 15% of its capital structure. And also at the mid-point of 2017 it had around $4 billion in cash floating around. Exxon is still in rock-solid financial condition. So, Exxon is financially strong, which is great, but it's also one of the best-run oil majors around. It's really items five and six together that make the difference, here. 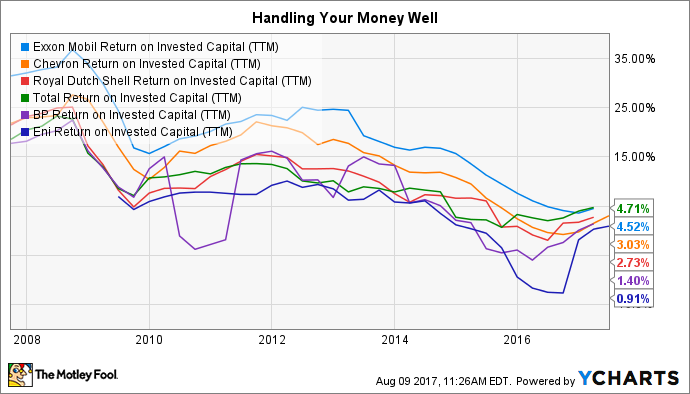 The easiest way to see how well management runs Exxon is to look at its return on invested capital, which effectively examines how effective management is at investing its shareholders' money. Exxon has, historically, been among the top performers in the industry on this metric. Enough said. We've covered everything from the future of oil to Exxon's financial condition and operating results. One last point worth looking at is the change that's taking place today. In some ways, it's a mixed picture, which helps to explain the relatively high yield noted above. But don't get too caught up in the supposed bad news. On the negative side of the ledger, a longtime CEO recently left the company to take a prominent place in President Donald Trump's cabinet. That means a new CEO is taking the reins, which is always a risk. But he's a company man steeped in the Exxon way, so it shouldn't be a big problem. Exxon also materially reduced its oil reserves because of low oil prices, trimming nearly 20% off the total in early 2017. That's an unusual step for the conservatively run company, but it's important to note that most of the cut came from its Canadian Oil sands investments. It's still operating that business, and if oil prices go up enough, those reserves will quickly be added back to the total. The cut was driven by SEC guidelines, which, in this case, are backward-looking and don't consider the importance of oil sands to the future global oil equation. Over the long term, this is likely to be much ado about nothing. On the positive side, meanwhile, Exxon recently bought natural-gas-focused InterOil and completed a deal to materially expand its reach in onshore U.S. drilling. Without getting into too much detail, both investments appear opportunistically timed (energy prices are still relatively low), and they expand the company's business in key areas. These appear to be the types of moves you want to see a company make. And they weren't so large as to cause financial strain. To sum this point up, the bad news surrounding Exxon is making really big headlines, but the full story isn't nearly as bad as the negative press seems to suggest. Good things are still taking place, and the bad things aren't necessarily as bad as they seem. Through it all, Exxon is working solidly toward the future. I think it's pretty clear that I believe Exxon is a good story today. In fact, I like the story so much, I own the stock. However, a good company isn't always a good investment, because price matters -- and that is the key here. It's a good company, and as I noted in point No. 4, it looks like it's trading at a decent price, which is why Exxon is the kind of company you could buy today and never sell. There are negatives in the air today, but that's what brought about this long-term opportunity.